because of the breakup of Seinendan (a group of young men). of Nobunaga Oda against Yoshimato Imagawa in the battle of Okehazama in 1560.
and welcomed his return in triumph with rejoicing. 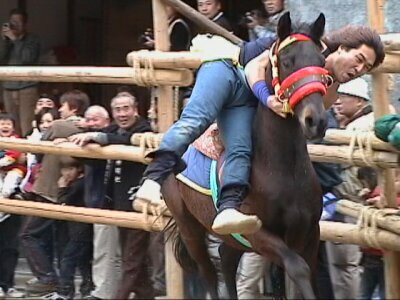 as few days dedication of horses to shrine. and dedicated dragon dance, Sasa dance and Kakeuma to Hirachi-shinmei-sha shrine in August 1st." Hirachi-shinmei-sha is the only shrine which has kept kakeuma in Handa city. Hekinan City(3 shrines) and Nishio City(1 shrine), they also keep similar Kakeuma. and they are raised in the Chita Peninshula and Nishi-Mikawa area. Take JR Tokaido-Honsen Line Bound for Hamamatsu or Toyohashi from Nagoya sta. Change the train at Obu sta. to the Taketoyo Line. Hirachi Shinmeisha (shrine) is 5 minutes walk from Kamezaki sta.